TV adventure personality and Brit scuba diver – Monty Halls – received Sport Diver’s 2016 ‘Outstanding Contribution’ at last month’s Sport Diver Awards. 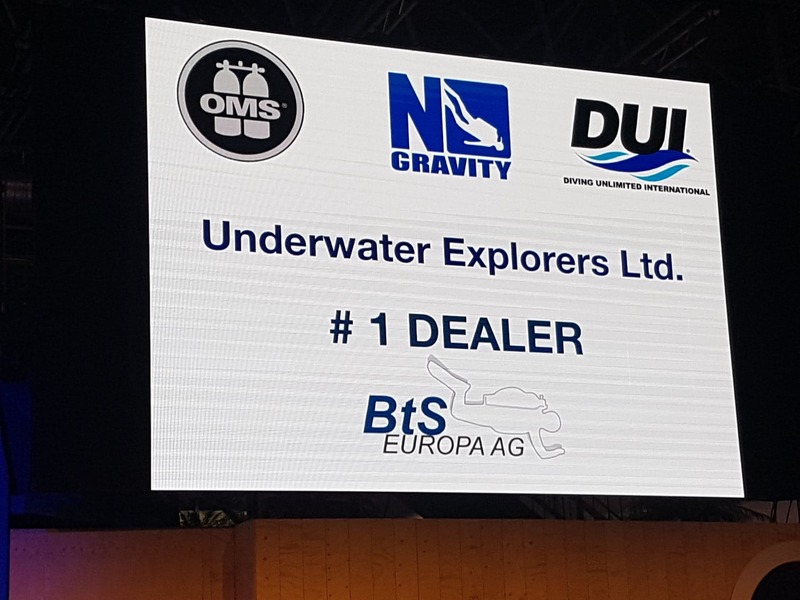 Mark Evans, editor of Sport Diver Magazine, explained how the judging team had made their difficult decision, because there were a number of worthy names on the list. Robert Parrington from Wakatobi made the announcement at the award ceremony. 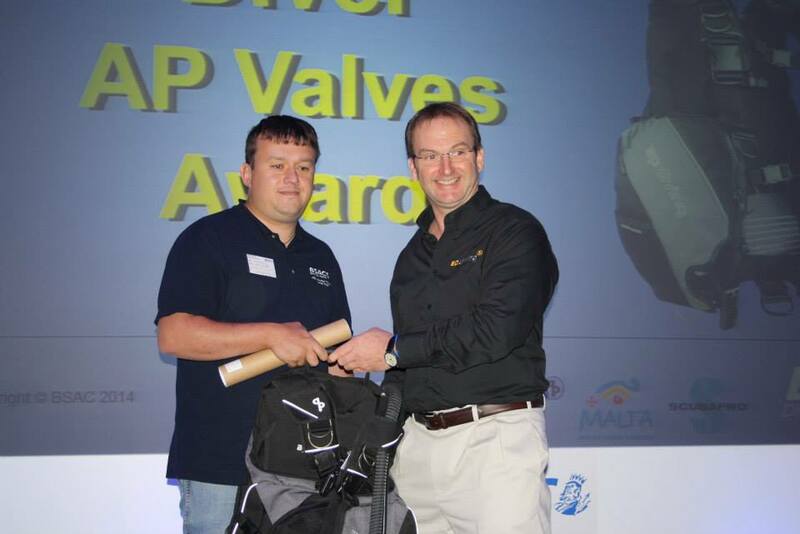 “This is an award recognising a person or company that has gone above and beyond in the name of diving. For 2016, the judges chose a truly worthy winner, someone who has arguably done more than anyone to get scuba diving in front of a mainstream audience on our TV screens. Over the past ten years, he has taken viewers around the world, from exotic destinations such as Indonesia, Japan, South Africa and the Great Barrier Reef, to closer-to-home but no-less-beautiful locations like Ireland, Scotland and Cornwall. In between these televised adventures, he has found time to pen several books, write numerous magazine articles and do the odd spot of motivational speaking. Along the way he has been upstaged by his faithful dog Reuben (sadly now departed), met and married his lovely wife, and had two wonderful children. Duncan Price Receives CDG Fish Award! The Cave Diving Group (CDG) is the world’s oldest diving club. It was founded in 1946 by cave diving pioneer Graham Balcombe. Today its function is to “educate and support cavers for recreational and exploratory operations in British sump conditions“. Cave diving in the UK is not particularly straightforward when compared with overseas sites. It is quite possible to park a vehicle near to the cave entrance, kit up and pretty much fall into the water in many countries. This rarely happens in the UK. The only site that instantly springs to mind for having simple logistical access is Wookey Hole in Somerset. In the main, a British cave diver has to be a pretty competent dry caver and they only tend to learn to scuba dive to be able to access passageway beyond a flooded sump. (A sump can be described as a submerged or flooded section of cave.) It is not surprising therefore that since its inception the CDG has attracted some remarkable characters and explorers. One such character was CDG Chairman, Mike ‘Fish’ Jeanmaire. Brian ‘Scoff’ Schofield, current Chairmen of the CDG said, it was Fish’s honesty and his ability to both respect tradition whilst allowing frontiers to be pushed back, that made him such a good Chairman of the CDG. Fish was to hold the post of Chairmen of the Cave Diving Group for thirty years until his health started to fail him. Following his death in November 2010 the ‘Fish Award’ was created. This is awarded annually to a member who has made a significant contribution to the CDG. Whilst the nature of the contribution is not precisely defined, the guiding principle is that the individual should have served the CDG rather than any other organisation or themselves. Traditionally the award is made by the previous winner. Andrew Ward – the 2015 recipient – presented the 2016 Fish Award to Duncan Price at the Cave Diving Group AGM and reflected on why Duncan was nominated. “Duncan joined the CDG in the mid-1980s and seems to have stayed. I have known Duncan since he joined and was the examiner for his pool test on a dark, wet night in Yate piggybacking onto a BSAC club’s training night. We needed a victim for the recovery part of the exam and the BSAC club kindly provided one. Unfortunately, the gentleman was of generous proportions, so this part of the test was more like a Greenpeace re-floating operation. I must have been lax in those days as he passed the test. From the start, Duncan has been active in all areas of caving and along the way found a reasonable amount of new passage. On top of this he has mentored new members as well as helping at training sessions where has passed on his expertise. Surveying was always a good session and a forte of Duncan’s. At one time or another Duncan has been the Welsh Section’s Training Officer, Secretary and Examiner – positions that allowed him to pass on his knowledge and experience that he gained as a trainee all those years ago. Duncan continues to be active within cave rescue and for that we can all be grateful. He has always been keen on producing gear to his own design and rebreathers are a speciality with their names generating interesting, and arguably contrived, abbreviations! The ‘Beneath The Sea‘ show celebrated a major birthday earlier this month. This USA based scuba diving event was founded in 1976, making this the 40th year Beneath The Sea has recognised divers who have made significant and lasting contributions in the fields of the arts, education, environment, service and science. Included in the 2016 ‘Diver Of The Year’ Class was Dr Drew Richardson for Service. Drew is PADI Worldwide’s President & CEO. Here is Drew’s acceptance speech. “Thank you. I’m honored and humbled to receive this recognition as there are so many other more worthy recipients out in the world. I’m passionate about diving and I’ve dedicated most of my life to it – to improving dive training to help make divers confident, competent and comfortable underwater. Many of you may not know this, but I lost my brother in a diving accident when I was eighteen. My brothers and I were all experienced watermen- competitive swimmers, water polo players, lifeguards and divers. In large part, his passing was a catalyst in my decision to dedicate my life to diving education and exploration and contributing to helping make it safer for all who choose to try it. I owe this honor to the many people who have worked with me over the years to make diving more than diving. To make it about changing lives. As I see it, when we bring people into diving, going underwater is just the start. We’re not just in the dive business, we’re in the life transformation business. Think about all of the amazing leaders who, through diving, change lives every day. A lot of these folks are in this room right now. Look at the women recognized here tonight in the Women Diver’s Hall of Fame. Cody Unser, you are a shining light and a rock star! Congratulations on this recognition. You open new doors every day for those who may have long thought them shut. And, Dawn Kernagis, well done to you, as well. Your contributions in diving physiology, research and exploration in diving are for the betterment of all divers. Margo Peyton isn’t here tonight, but she’s inspiring the next generation to become divers and join the ranks of dive professionals, leaders and ocean advocates. All of the Women Diver Hall of Fame members are all special and remarkable in their own right as leaders and role models. They change lives every day. And then there’s my fellow Diver of the Year and Diving Pioneer award recipients. Wayne [Hasson], congratulations to you on receiving the 2016 Diving Pioneer award – this award is well deserved. Fabien Cousteau, congratulations to you, as well, and thank you for carrying on your family’s legacy. Richard [Lutz], congratulations and thank you for sharing the impact and importance of a perceived alien world with millions, influencing them to care. Wendy [Benchley], thank you for standing up for shark protection to ensure future generations will have the opportunity to experience these majestic creatures. And, to my friend, Bill Ziefle, thank you for standing up for diver safety through the efforts of DAN to ensure there’s help divers when they need it the most. And, of course, I would be remiss if I didn’t recognize the Beneath the Sea steering committee . . . Zig and JoAnne, Bob and Maria — along with all of the show volunteers who have humbly supported and served the dive community for 40 years. Their efforts have changed hundreds of thousands of lives over the years and provided new opportunity to our diving youth. They are the lighting rod in bringing us all together as a community. Thank you. As divers, this is what we do. Through many ways, means and methods, we change lives. Some of us change lives in big ways, and others in small ways. But, it’s all significant. I am honored to be among you all. When I think about the future, I think about the ways we can inspire the global family of divers to stand together to pay it forward. To care about something much larger than ourselves, this includes adaptive scuba and also about as a community paying it forward by about turning around to the next person in line and helping them along on their journey. This includes ocean conservation, underwater cultural heritage and preservation, and defending and protecting our ocean. While, as individuals, we all touch lives for the better, together we can make a meaningful difference. There’s no group better positioned to accomplish these things than divers. Success depends upon you – and every diver around the world – taking action. Let’s work together to unite a global force of divers to drive forward as agents to change. Let’s join together to take care of this gift that takes care of all of us. Now that’s life transforming. I never get tired of seeing the PADI family change lives with diving. While this is reward enough, I deeply appreciate this recognition of my contributions to the industry and sport. I will use it to help inspire other to change lives and band together to save our oceans. DIWA – ‘Diving Instructor World Association‘ – was founded in 1972. It is an international organisation for commercial diving instructors. 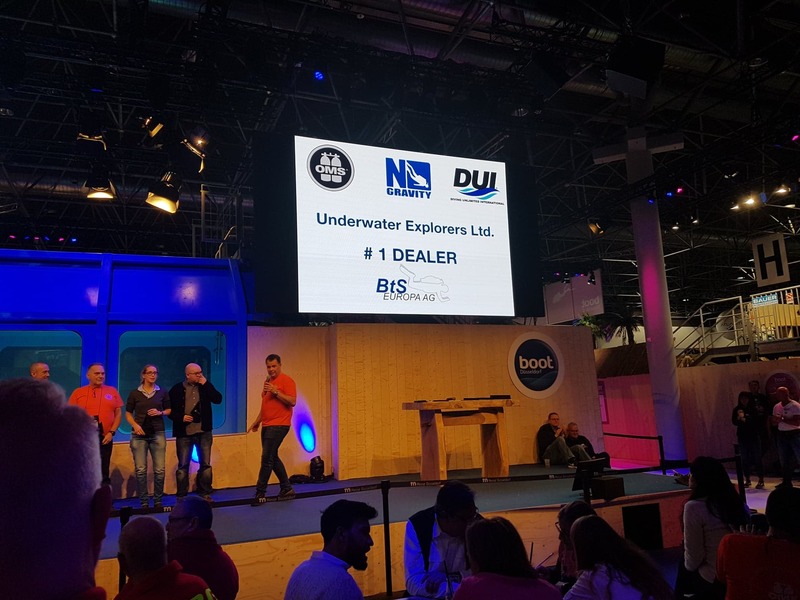 These annual awards are announced at the Boot Dusseldorf Show in Germany. DIWA instructors nominate the candidates. The winners are then decided by the directors of DIWA International. DIWA acknowledged that X-Ray Mag was the trail blazer in digital dive publishing, establishing a high quality international magazine that consistently publishes fresh scuba stories, sourced from across the globe. Sabine Kerkau‘s sustained writing and technical diving exploration efforts during the last 15 years were also recognised. She received the DIWA journalism award. Kerkau’s work has been published in WETNOTES (the German advanced and technical diving magazine), Tauchen and X-Ray Mag. During the award speech DIWA compared Sabine Kerkau to Indiana Jones, saying she was a great role model and inspiration for technical divers. Henry Jager was given the DIWA award for photography, Uwe Fleischmann received the DIWA award for diver training, whilst Vladimir Putin was announced as the DIWA ‘noted contribution’ award winner, for protecting the Siberian Tiger from extinction. We reported earlier this year that filmaker, underwater explorer and Puget Sound environmental diver – Laura James – had won her second consecutive Emmy in the ‘Environmental Feature / Segment’ category for her story ‘Solving the Mystery of Dying Starfish‘. Now this respected technical mixed-gas-diving instructor and rebreather diver has been named as an Oris Watch Sea Hero by Scuba Diving Magazine. This award – sponsored by Scuba Diving magazine and Oris Watches – recognises scuba divers who have made a difference, by working tirelessly to protect our oceans through education, conservation and action. Previous award winners include Annie Crawley and Jill Heinerth. If you know someone like Laura James, Scuba Diving Magazine is asking for your help in locating future Sea Heroes. You can nominate anyone you know who deserves this special award. The 2014 BSAC Diving Conference was held on Saturday 25th October at the Birmingham NEC. Attending delegates enjoy a packed and informative programme of BSAC news, diver training updates and open forums. 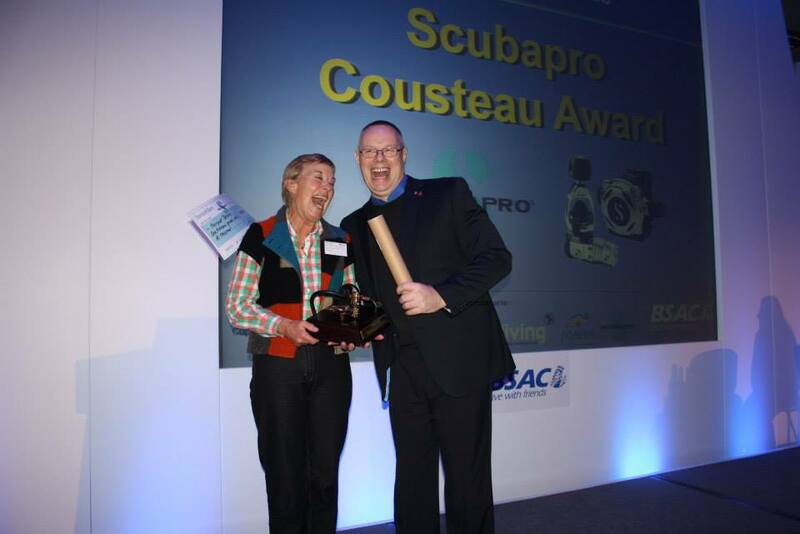 More photos and news from the BSAC Diving Conference 2014 can be found here.